Nine figures at the edge of a small but dense grove of orange trees. The ground beneath them is rich with a huge variety of different plants, as indicated by the flowers interspersed throughout. Mercury, who holds his caduceus up to quell a small group of dark clouds, but faces away to the left, looking up at those clouds. Alessandro di Mariano di Vanni Filipepi, known generally now by the name of Sandro Botticelli, was born in the city of Florence in about 1445. He became an apprentice, possibly first as a goldsmith, and at some time is thought to have worked in Fra Filippo Lippi’s workshop. During that period he was involved in the creation of a fresco in Hungary, but little else is known until he had established his own workshop in Florence by 1470. In 1481 he was among the artists summoned to paint the walls of the Sistine Chapel. He also produced illustrations for the first printed edition of Dante’s Inferno in 1481. 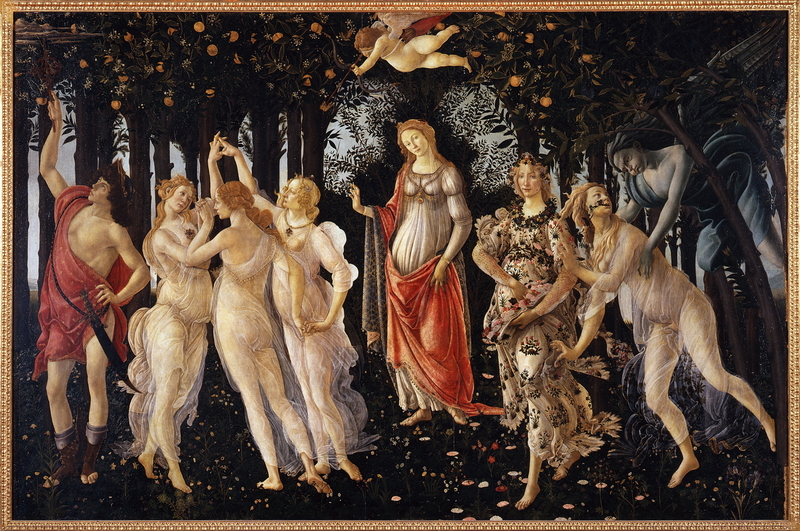 The Primavera was commissioned by his patron Lorenzo di Pierfrancesco de’Medici, for his Florence residence, but was later moved to his residence at Castello, where it was joined by The Birth of Venus. Botticelli was involved with considerable work for churches and villas, but later came under the influence of Savonarola, and his output fell. He died on 17 May 1510. Following his death his work fell out of favour until it was rediscovered by William Young Ottley, a British collector, in 1799. He became particularly popular in the early part of the twentieth century. As this is a narrative painting depicting mythological figures, each a deity from the Roman pantheon, we need to reconstruct their identities and the underlying narrative. There are many different theories which attempt to explain the meaning of this painting, but before considering that it is essential to discover who is doing what, at least on the surface. The rightmost figure is Zephyrus, the west wind, famed for bringing warm, moist air to the Mediterranean in spring, thus bringing the first crops on after the winter. Translated by A. S. Kline 2004 All Rights Reserved, from here. The Latin text is given in the Annex below. 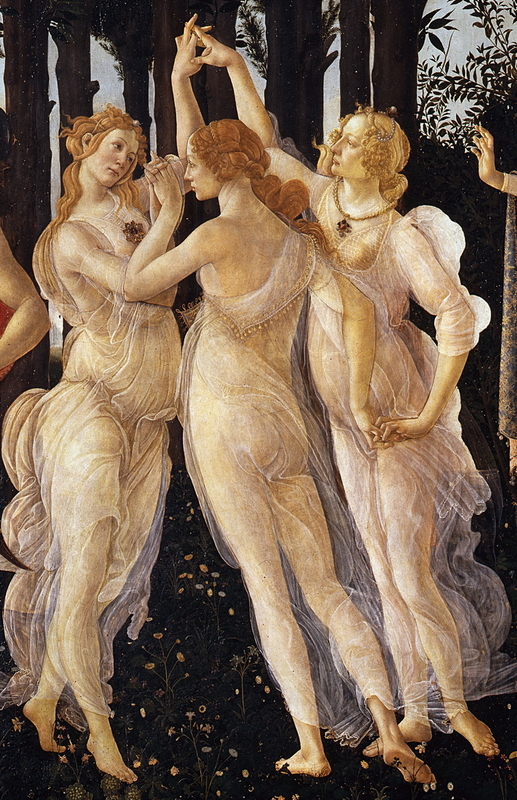 To the left of Flora are the three Graces, or Charites, said to be the daughters of Zeus and Eurynome, or Dionysus and Venus: Aglaea (representing splendor), Euphrosyne (mirth), and Thalia (good cheer). By Homer’s time, they had become part of the retinue of Venus. Two bear distinctive pendants at their breast, which could enable them to be distinguished, but I have not found anyone prepared to go into such detail. Although one is shown here as taking a fancy to Mercury, and possibly about to be the recipient of one of Cupid’s arrows burning with desire, I cannot find any reference to a relationship between Mercury and one of the Graces. 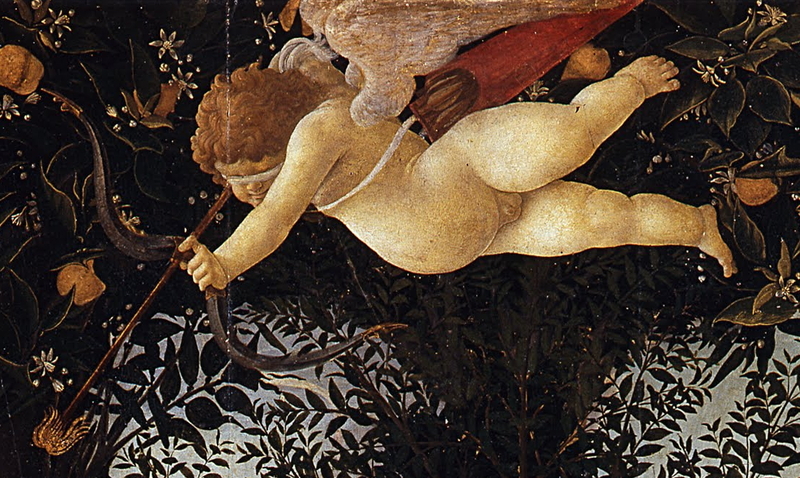 Venus is the mother of Cupid, and (often) of the Graces. 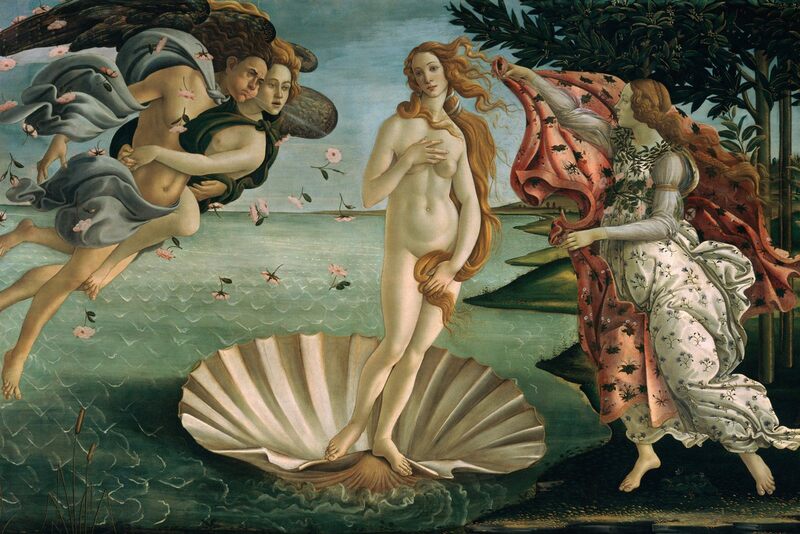 Her central place here may put her in the role of oversight, and Botticelli had a predilection for portraying Venus, in his famous works The Birth of Venus, showing her maritime origins, and her relationship with Mars in Venus and Mars. Her pregnancy associates her with fertility and fecundity, a key theme in the Spring. It is also tempting to invoke aspects of the Virgin Mary in this depiction of Venus; although also associated with carnal love, there was a Platonic side to Venus, perhaps marked here by her unusually complete state of dress. However other clues suggesting symbolism with the Virgin Mary such as her characteristic blue mantle or dress are absent. 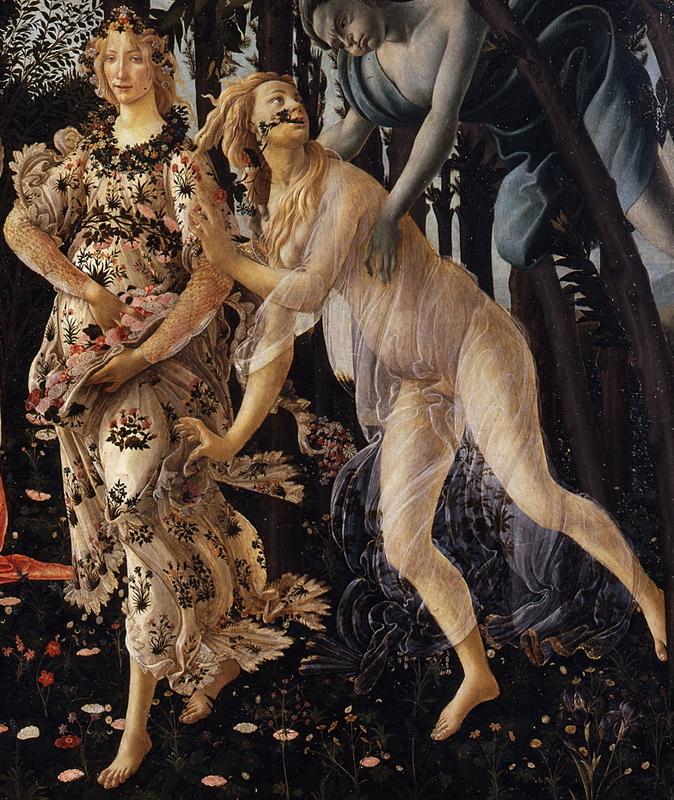 Sandro Botticelli (Alessandro di Mariano di Vanni Filipepi), Venus and Mars (c 1485), tempera and oil on poplar panel, 69.2 x 173.4 cm, The National Gallery, London. WikiArt. Cupid is the personification of love; although also capable of stopping desire, his burning arrows resulted in burning desire to inflame the heart. He is one of the most popular of the Roman deities to be shown in paintings, and his influence is also seen in the cherubic putti which often adorn more Christian works of art. Mercury is the son of Maia (who gave her name to the month of May, hence his association with Spring) and Jupiter. He is the Messenger of the Gods, and is marked by his staff or caduceus, which is normally depicted with entwined serpents along its length; Botticelli has chosen to give them wings to resemble dragons instead. He is also more typically seen with his caduceus in his left hand, rather than his right as shown here. Mercury’s special boots, often shown with wings attached, as also seen. Despite these rich and very detailed allusions to pre-Christian pagan religion, it is generally agreed that this painting, Botticelli, and the Medicis were Christian, and had no leanings towards old religions. Instead these Classical symbols were interpreted in Christian or Neo-Platonic terms, for example with love being platonic rather than carnal. This huge painting is a superb technical achievement, being painted in around four layers of tempera grassa, or egg tempera mixed with drying oil. Whilst painters of the Northern Renaissance had been using oil paints throughout the fifteenth century, those in the Italian Renaissance were considerably slower to switch from old egg tempera to new oils. Egg-oil tempera was a highly successful intermediate step, which some experts even today consider to be longer-lasting than good oil paints. 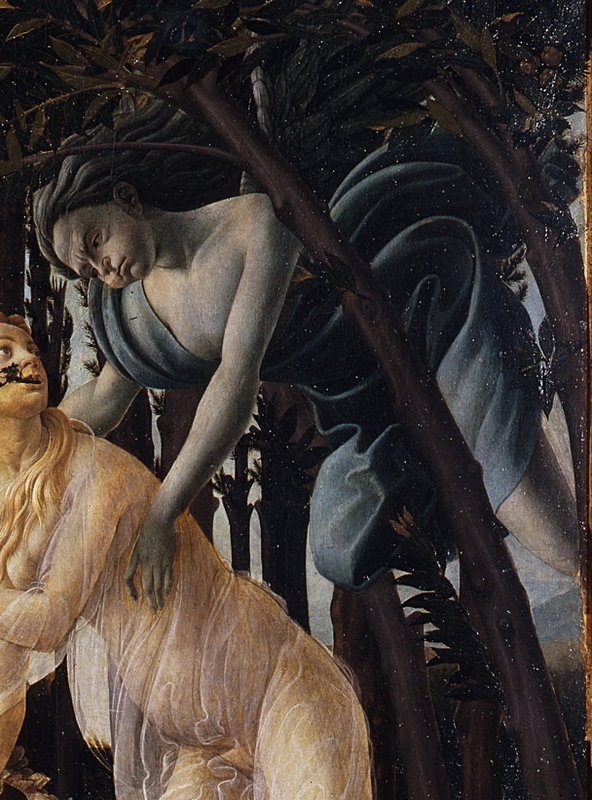 However, because this tempera was still very much quicker to dry than proper oil paints, it limited the techniques open to Botticelli and his contemporaries using it. This in turn made it harder for them to depict the surface light and texture effects which those in the North had revelled in since van Eyck and his contemporaries. Nevertheless Primavera is an extraordinarily beautiful and fascinating painting, with a rich and perhaps still enigmatic narrative. It is one of the great paintings of the Renaissance, and of all Western art. Frazier JG trans (1996) Ovid. Fasti, Loeb Classical Library, Harvard UP. ISBN 978 0 674 99279 5. (The only readily available text and translation of the Fasti.) Note that an older edition is available free from here. The first painting featured in the BBC TV series (2001-10)The Private Life of a Masterpiece, it is available in the DVD set ISSN 5 014503 239824, details here. Insequitur; fugio. Fortior ille fuit. Ausus Erechthea praemia ferre domo. Inque meo non est ulla querela toro. Vere fruor semper: semper nitidissimus annus. Arbor habet frondes, pabula semper humus. Est mihi fecundus dotalibus hortus in agris. Aura fovet; liquidae fonte rigatur aquae. Atque ait, Arbitrium tu, dea, floris habe. Nec potui; numero copia major erat. Inque leves calathos munera nostra legunt. Posted in Painting and tagged Botticelli, Fasti, Metamorphoses, myth, Neoplatonism, Ovid, painting, renaissance, Roman. Bookmark the permalink.